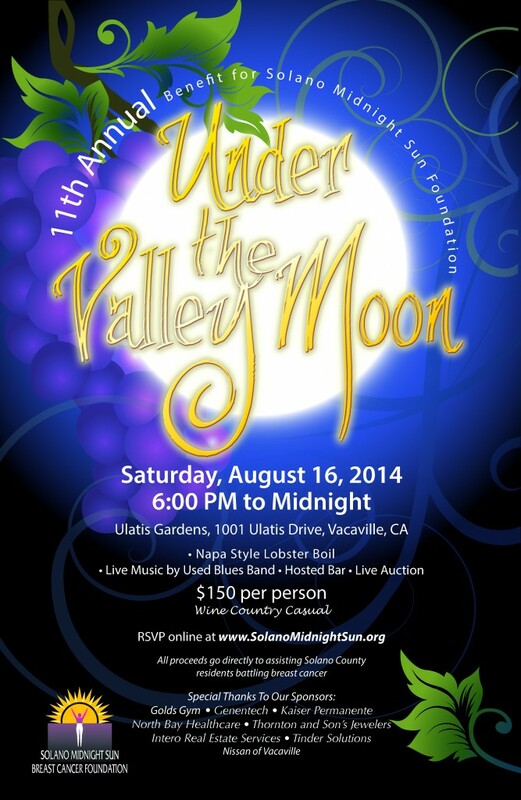 An Evening Under the Valley Moon is the SMSF’s signature fundraising event. The 2014 event featured an amazing Napa-Style Lobster boil, a Live performance by Used Blues Band and Live Auction. This year’s raffle included a one-of-a-kind custom design designed pendant and two additional pieces donated by Thornton & Sons Jewelers. The Solano Midnight Sun Foundation (SMSF) works to promote breast health and early detection of breast cancer in women. Our mission is to provide assistance and resources to women in our local community affected by cancer. We offer temporary financial assistance to women who have experienced a financial hardship during their cancer treatments and need help paying for basic living expenses and we also provide mammogram sponsorships to under-insured women. Established in 2004, the Solano Midnight Sun Foundation is a volunteer-driven, local nonprofit organization, serving Solano County.